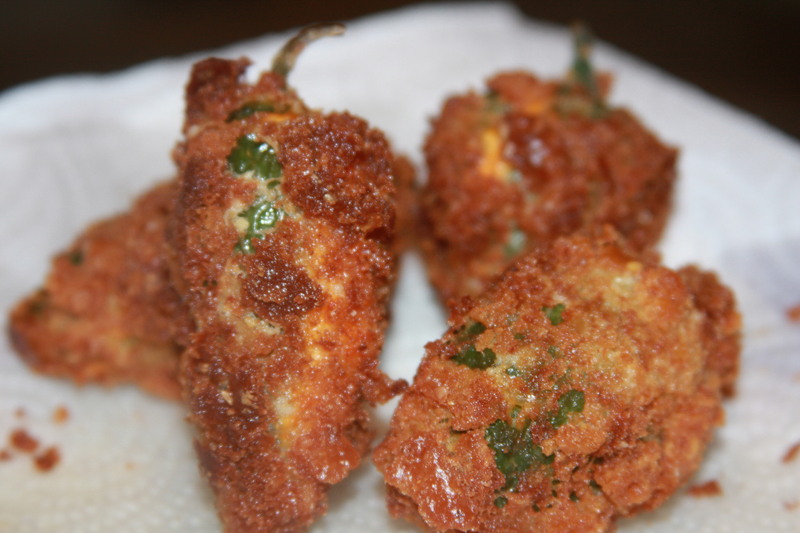 I remember (years ago… before I was vegan) eating delicious jalapeno poppers at some local restaurant like Chili’s or somewhere. I absolutely loved them. When I went vegan, I sadly thought I was giving up these deliciously sinful cheese filled treats. WRONG!! I don’t know if it was being sick this last week (ironically from a COLD) or what it was exactly that gave me the desire to attempt to make these hot & spicy body cleansing (or clogging, depending on how you look at it) appetizers, but, boy am I glad I did! I didn’t have panko bread crumbs on hand, so I actually tore up some extra bread we had lying around into little teeny tiny bits/crumbs. A food processor would probably have done the job too. I crushed a couple Ritz-style crackers in there as well. Voila. 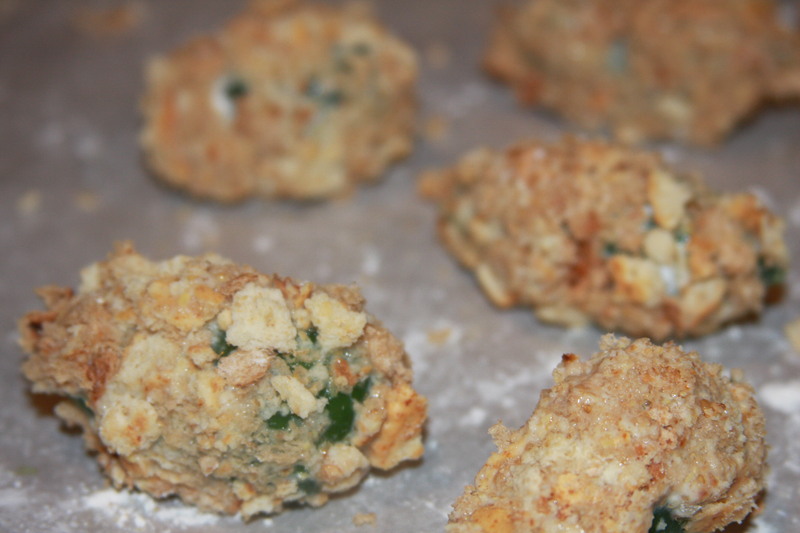 Homemade bread crumbs. Please be advised that the filling could EASILY be halved. 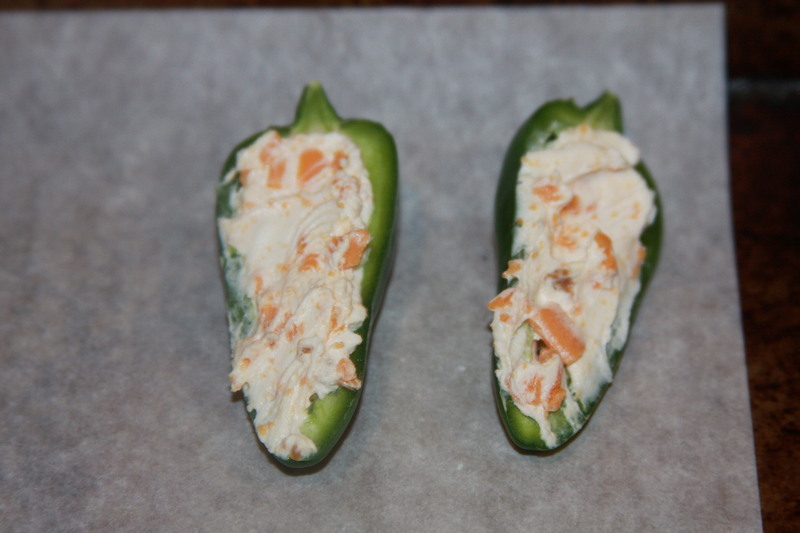 I have an entire half batch of cream cheese yummy mix sitting in the refrigerator… which would’ve been great if I was making 24 jalapeno poppers! But hey.. now I have a flavored cream cheese spread for bagels! 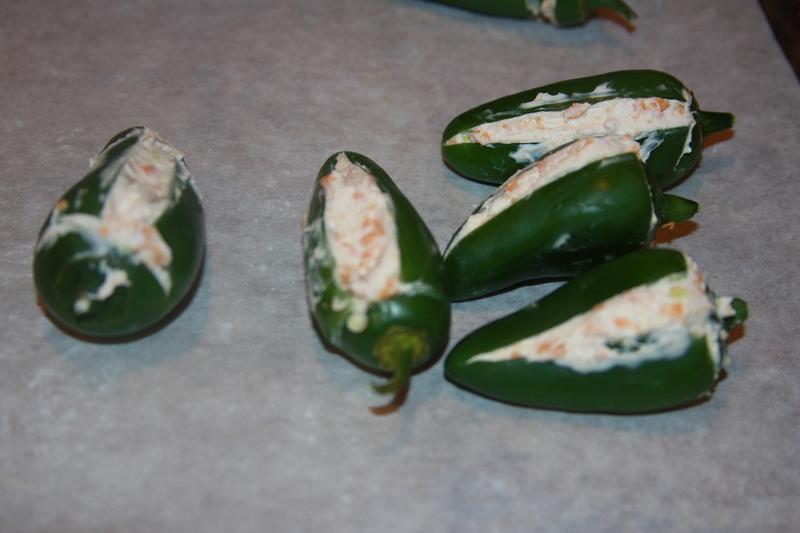 Method 1 – slicing the peppers in half lengthwise. This made for easy scraping and removal of seeds & veins. 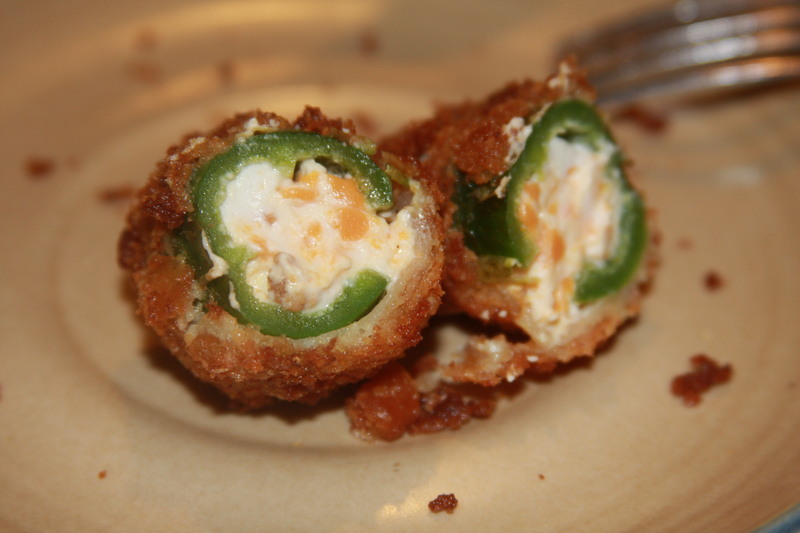 Definitely the fastest way… seems to make more since every 1 jalapeno becomes 2. Just a matter of preference. Do you want half peppers or whole? May be easier for some people to eat them this way, since they don’t have to take such giant bites… ideal for parties. I was worried they wouldn’t cook well since the cheese was exposed but I was pleased with the surrounding breaded outcome. 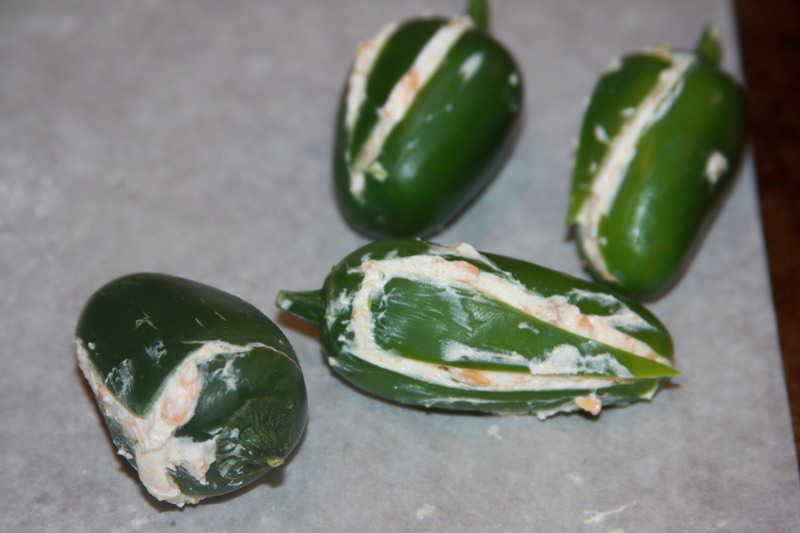 Method 3 – Cutting a “T” shape into the jalapeno and then carving out the insides. A little tricky to not crack it, but easy enough to make it one of my favorite methods. Easy to tell when they are nice and full! 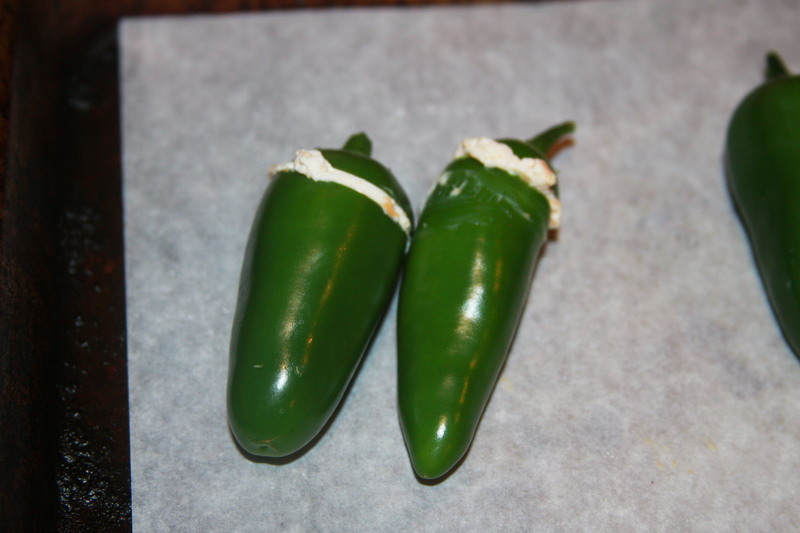 Method 4 – Cutting a skinny triangle out of the jalapeno side, filling the pepper and sticking the triangle back in. Fast. Efficient. Easy. I suggest you experiment with each method and decide what YOU think is easiest. Okay… here we go… Time to make the poppers!! 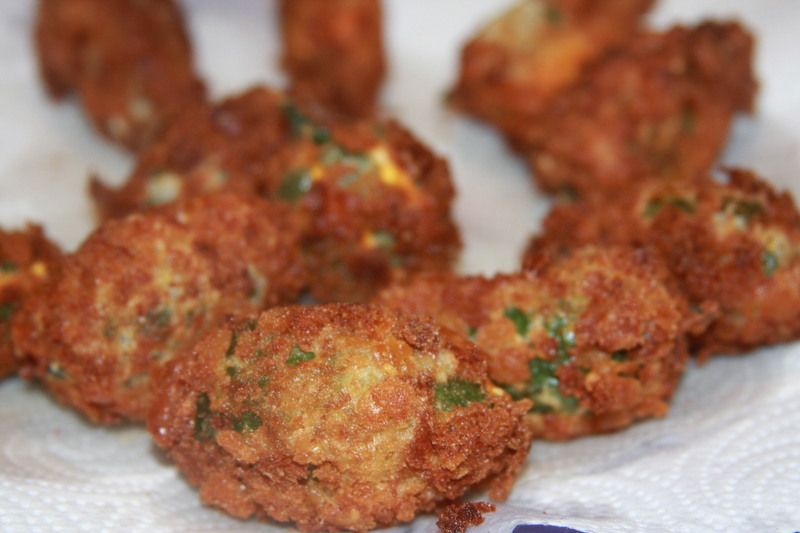 1) Dip the filled jalapeno into flour/cornstarch mixture. Then dip in milk. Set aside to “dry” for a moment. If you cut me in half, I can be a pretty butterfly or a heart! Some say “beat the heat”… I say “EAT the heat”… With a BIG glass of something cold on the side! 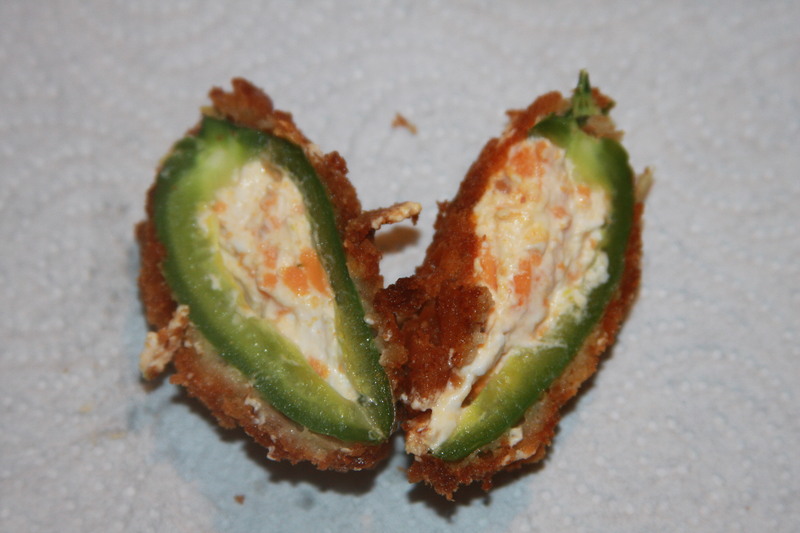 This entry was posted in appetizers, snacks, Using Tofutti Products and tagged easy jalapeno poppers, entertaining, jalapeno poppers, party food, Vegan, vegan appetizers, vegan jalapeno poppers, vegan poppers. Bookmark the permalink.